We’ve recently told you about civil forfeiture. They actually have wish lists of items – referred to as “little goodies” – they want. Items that belong to you. This hideous practice extends to your car – and your home. There is incentive for them to take what’s yours. The American public should not be playing Santa Claus to the cops whose salaries we already pay! 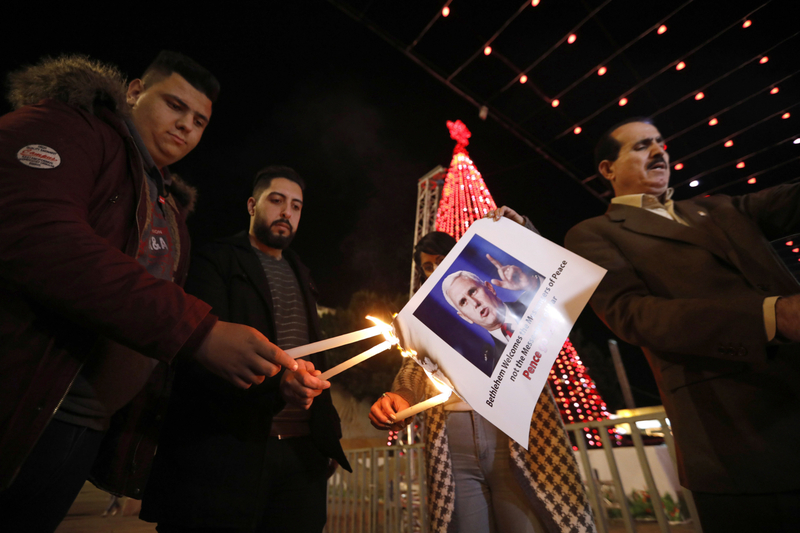 Palestinians burn picture of U.S. Vice President Mike Pence during a protest against Trump decision to announce Jerusalem as the capital of Israel and “pilgrimage” of Pence to Bethlehem. Twice in one week, the United Nations slapped the Trump Administration in the face in voting by a huge majority to reject the US unilateral recognition of Jerusalem as Israel’s capital. In specially called sessions, the Security Council voted 14-1and the General Assembly 128-9 to censor the U.S. decision as violations of international law and UN resolutions.. Meanwhile, mass anger in the Middle East has forced Vice President Mike Pence to cancel a planned “Christmas Pilgrimage” where this evangelical rightwinger had hoped to create divisions between Muslims and Christians. Instead, unpredented numbers of Christian leaders in the area have come forward to denounce Washington’s decision. Pence’s picture was burned and stomped in Bethlehem’s Manger Square, a town traditionally associated wth Christianity. One by one, Palestine Authority head Mahmoud Abbas and then the region’s Christian leaders publically canceled their meeting with Pence, excoriating the U.S. and declaring solidarity with Palestine. Approximately 20 percent of the Palestinian people are Christian, and Arab Christians are an integral part of the region. On Dec. 6, Trump announced that the United States was the first country to recognize Jerusalem as the capital of Israel. This was a frontal attack on the rights of the oppressed Palestinian people and a gift to the racist, apartheid government of Israel, whose aim is to colonize all of Palestine and drive out as much of the indigenous Palestinian population as possible. It is also a gross violation of international law and defies the many international bodies that regard the 1980 Israeli annexation of East Jerusalem as illegal. The West Bank, Gaza, Syria’s Golan Heights and East Jerusalem were seized by Israel using U.S.-supplied arms in the 1967 Six Day War. While it is not on the front pages, it was not just a Republican endeavor. The Democratic Party leadership in the U.S. Senate also supported Trumps announcement. On Dec 5, Minority Leader Chuck Schumer, the Senate’s top Democrat, said that he had advised Trump to declare Jerusalem as Israel’s “undivided” capital. Maryland Senator Ben Cardin, the ranking Democrat on the Foreign Relations Committee, reiterated his support for recognizing Jerusalem on Dec. 4. Meanwhile, this has also been the position of Hillary Rodham Clinton for many years. In 1999, when running for New York Senator, she called for Jerusalem to be the “eternal and indivisible capital of Israel” and pledged to move the U.S. embassy there. Only nine states – including the United States and Israel –voted against the resolution. The other countries were the tiny, vunerable nations of Togo, Micronesia, Nauru, Palau, Marshall Islands, and the rightwing regimes in Guatemala and Honduras. While 35 countries abstained due to U.S. pressure, even ambassadors from abstaining countries, including Mexico, used their time on the podium to criticize the Trump administration’s decision. On Dec. 18, an identical resolution in the Security Council, passed 14-1, but was then vetoed by the U.S., the only government opposing it. Palestinians, Arabs, Muslims, and concerned individuals organizations and governments have responded to Washington’s recognition of Jerusalem as Israel’s capital with denunciations and protests. Demonstrations have taken place across the globe, including many in the US. On Dec. 13, in Istanbul, the 57 member Organization of Islamic Cooperation said it considered the U.S. action legally null and would hold Washington responsible for any consequences. Speaking there, Palestinian Authority President Mahmoud Abbas said, “We will no longer accept that [the U.S.] has a role in the political process,” and canceled a meeting with U.S. Vice President Mike Pence. Many in the Palestinian struggle and progressives around the world feel that the U.S. has never been an impartial mediator, instead serving as a cover for Israeli aggression and land theft. Since the 1993 Oslo Accords, every U.S. administration, Republican and Democrat, has mediated Palestinian-Israeli talks on implementing a Palestinian state in the West Bank and Gaza. In that time Israel has seized control of 60 percent of the West Bank. Some 2.6 million Palestinians are being squeezed into ever-smaller spaces, making a contiguous viable Palestinian state impossible, with a map of the borders where Palestinians still maintain some control looking like Swiss cheese. While UN resolutions have denounced settlements, today some 600,000 Jewish Israelis live in government-subsidized settlements there–1 out of 10 Israelis. The Palestinian population is constantly harassed by Israeli soldiers, 40 percent of the men on the West Bank have been arrested, and 99 percent of Palestinian cases in Israel’s military court end in convictions. Israel used its U.S-supplied arsenal for massive bombardments of Gaza in 2008-9 and 2014, targeting homes and hospitals. Gaza’s 1.8 million people, without water or natural resources, have been embargoed and blockaded since 2007, denied essential medicine and construction materials to re-build homes. Its population is held prisoner, unable to leave. Meanwhile Pence, an evangelical Christian, had planned a “Christmas pilgrimage” to Palestine this month to drive a wedge between Middle Eastern Christians and their Muslim neighbors. But this has badly backfired, as these Christian leaders have canceled their meetings with Pence and roundly denounced him. In Bethlehem, where the Abbas-Pence meeting was to take place, a banners now hanger on Manger Square near the Church of the Nativity reading, “Bethlehem refuses US vice president’s visit.” On Dec. 17, protesters burned and stomped on photos of Pence and his chief negotiator, Jason Greenblatt, in that town’s Manger Square. In a highly unusual move, Al-Rai gathered Catholic and Orthodox patriarchs and representatives, as well as leaders of the nation’s Protestant churches and Sunni, Shiite and Druze communities in an Interreligious Summit in Lebanon to discuss the Trump announcement. A Dec. 14 joint statement stressed that Jerusalem “has a privileged position in the consciences of believers of these faiths,” and that “The U.S. president’s decision, based on special political calculations, is a challenge and a provocation for more than 3 billion people and touches on the depth of their faith,” the statement said. What’s behind the guilty plea of Gen. Michael Flynn? It is critically important to understand the crime that Michael Flynn pleaded guilty to on December 1. Michael Flynn pleaded guilty to “lying” to the FBI four days after Trump became president. The FBI, then led by James Comey, knew they had the “goods” on Michael Flynn from the fourth day of Flynn’s tenure as National Security Advisor. By January 24, the FBI agents had in their possession secret transcripts provided by the National Security Agency of two phone calls that Flynn had with Russian Ambassador Sergei Kislyak following Trump’s victory in the November 2016 elections. Flynn pleaded guilty to not having told the whole truth about these two calls during his voluntary interview with FBI agents on January 24. The first of the two calls was on Dec. 22, 2016. Flynn asked Kislyak if the Russians would consider voting no or delaying a UN vote on a resolution that condemned the Israeli West Bank settlements. Israel was enraged about the resolution and Obama had planned to have the U.S. abstain. 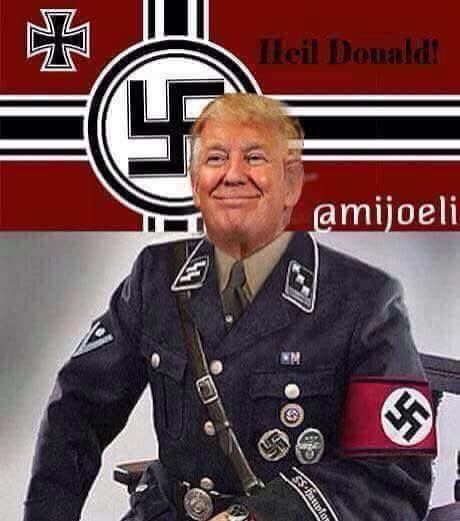 Trump, during the campaign, had vowed to adopt a more “pro-Israel” stance upon assuming the White House. That’s it. This obviously proves nothing about Russia “interfering” or influencing the outcome of the 2016 election campaign. These facts matter because of the false media propaganda misleading the public. Flynn, a loathsome instigator of war against Iran, is out of money. Unlike Kushner and the other super-wealthy members of the Trump entourage, he cannot afford the millions in dollars for a legal defense against the Mueller investigation. He also probably committed other acts in his role as a paid lobbyist on behalf of Turkey that could have sent him to prison for many years. So he pleaded out to a throw-away charge that ensnares many people who don’t tell “the whole truth” when being interrogated by FBI agents. Mueller doesn’t have facts proving Russian interference in the elections on behalf of Trump. So he is instead using the tried and true tactic of the intelligence services and police: Get people in their grip and threaten them with decades in prison. Compel these people to offer up names of others who “did something” so they can be indicted as well. This makes for good headlines, seems like “proof” that the Russia investigation is “getting somewhere” and allows the anti-Russia witch-hunt driven by the Pentagon and surveillance state and corporate-owned media to keep gathering steam. Meanwhile the liberals connected to the Democrat Party, who are by far the politically dumbest part of the population, play the role of cheerleaders for the FBI – the same institution that they used to hate and fear. 1) Flynn did not accurately tell the FBI agents about the content of two phone calls that have nothing at all to do with alleged Russian interference in the 2016 election. 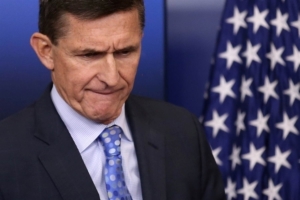 2) Flynn called the Russian Ambassador on December 22 on behalf of a stance adopted by the Israeli government, and rejected by Russia, opposing a UN Resolution condemning illegal settlements in the West Bank. The investigation of alleged Russian interference in the 2016 election was initiated by James Comey and the FBI in July 2016. Eighteen months later, there has not been one conclusive piece of evidence offered to prove that assertion. Underneath the investigation is the fundamental political objective of the campaign: to demonize and target Russia and justify a new Cold War and the ever increasing expansion of the military intelligence complex and U.S. intelligence agencies. Posted in USAComments Off on What’s behind the guilty plea of Gen. Michael Flynn? Republican tax reform: All power to the billionaires! A Republican dominated Congress has just approved a massive rewrite of the current tax code that will end up giving approximately $1.5 trillion dollars in tax cuts to the wealthiest corporations in the United States over the next 10 years. In order to make up this huge loss of revenue to the federal government, Congress will dramatically increase the tax obligations of working people. This is the most significant transfer of wealth since Reagan initiated his tax plan in 1986. Whole communities will be transformed and devastated, income inequality will continue to deepen, and corporations will get even wealthier. This is the world the U.S. Congress is seeking to create. One would expect such a massive change in our society to have been accompanied by a long and thoughtful process filled with debate and analysis. However, none of that occurred as this current plan materialized. Instead, the plan was written and approved in record time, mostly behind closed doors accessible only to lobbying firms and wealthy donors. Nearly 500 pages were written and then voted on hours later, before any of those voting even had time to read it. Yet there is method to the madness. Had the public the time to read and analyze this document, the plan would have most certainly died as people realized how seriously they would be hurt. Instead, it needed to be rammed through with a minimum of oversight or checks and balances from the public. It was the only way it could win approval. It has been a truly undemocratic process. Take a moment to consider the changes to the Affordable Care Act a.k.a. Obamacare. The tax plan will cease to require individuals to be insured under it, further destabilizing the marketplace for more affordable healthcare. Many millions of people depend on insurance plans mandated under the ACA to prevent total financial ruin in the event of a serious health problem. These people will suddenly be uninsurable or will be forced to pay for health plans which provide even less than the bare minimum of care. While on the subject of healthcare, Congress has decided to end the Children’s Health Insurance Program (CHIP). This means that 8 million children, people who are too young to afford healthcare, will be forced to live, and die, without it. On the other end of the spectrum are the corporations which make billions of dollars in profit every year. They will enjoy a tax cut from roughly 35 percent to 21 percent, one of the largest in recent history, resulting in a budget shortfall of nearly $1.5 trillion. Keep in mind these are corporations which already barely pay taxes at all, such as Apple Inc, which is actually an Irish, not a U.S., company. Due to their being domiciled in Ireland they enjoy a 0 percent tax rate so long as they keep their money abroad. What little funds they do have in the U.S. will now be taxed at a significantly lower 21 percent. This is to say nothing of the complex web of LLCs, Cayman Island funds, and special investment vehicles that corporations utilize to evade and avoid taxes entirely. Currently, nearly half the wealth in the United States is owned by three men and yet this is still not enough money. More must be taken from the working class through this vicious tax plan to feed the desperate hunger of capital. The massive reduction in revenue will increase the budget deficit, something the GOP has long railed against. Why are they so willing to reduce federal revenues and increase the deficit? Because it means, ultimately that under their own budget rules, they will ultimately have to cut even more services in an attempt to balance the budget. The truth is that the Republican Party has no interest in benefiting the many millions who live in the United States. When they say “make America great,” “America” to them means the ultra-wealthy. Their role today is to empower and expand the interests of U.S. capital. 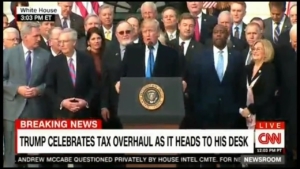 Having successfully robbed children of healthcare, Trump looked back at a crowd whose combined net worth dwarfs that of most countries and called them “Very, very special people.” While Trump exalted in these people who had “worked for years” to accomplish this massive gift to corporations, he ignored, of course, the many millions who must work for years to just have enough food to survive. Is the problem “spineless” Democrats? However, let’s not forget the Democratic Party. It would be wrong to not lay blame at their feet. As the recent defeat of their anointed candidate Hillary Clinton demonstrated, they are, and always have been, a party of the banks, of the warfare state and of the capitalist class. Some headlines were made in which the Democrats hinted at possibly threatening a government shutdown if some of their demands were not addressed in the tax plan. This was a much loved strategy of the Republican Party during the Obama Administration and so a precedent had been set. At the last moment the Democratic Party backed down citing “promises to talk” by the Republican Party. Having won nothing substantial or binding, the Democratic Party quickly backed down clearing the way for the largest transfer of wealth in U.S. history. Some on the left bemoan the “spinelessness” of the Democrats, yet to say this is based on the incorrect belief that the Democrats desire to see the tax plan fail because they disagree with its aims. Nothing could be more false. The Democrats deeply want to see tax cuts for the wealthy pass because their billionaire donors also demand such cuts and reforms. However, they wanted this accomplishment to occur under a Democrat controlled Congress wherein they could take credit. This would have been a valuable feather in their cap ensuring still greater contributions from the wealthiest of society. Instead they had to watch the Republicans achieve this and so we witness their feigned outrage. Why is this happening and what can people like you and I do about it? Progressive political movements have reached a low point today because of their loyalty to the Democratic Party, a party which is expert at coopting radical and progressive demands to ensure such demands remain toothless. No one identifying as “progressive” can truly believe that a party backed and funded by Goldman Sachs or Walmart actually has the interests of working class and poor people in mind. The sooner the people realize that the Democratic Party represents a graveyard for social movements the sooner we can begin the work of building a truly radical, progressive, and socialist party that will be able to effectively challenge and defeat the powerful ruling class interests that have seized control of our Congress. However, so long as we look to the Democrats for victory, we will be disappointed. The Republican tax plan represents a huge acceleration of income inequality in our time but it is not inevitable. Social movements have repeatedly challenged and defeated power structures throughout human history. Today is no different. At a time when the stakes have never been higher, when the class lines have been so clearly drawn, when the world desperately needs a radical socialist vision, we cannot afford to be still and silent. The people must unite, must fight back, must lose their faith in the Democratic Party, and build a revolutionary party that is truly of, by, and for the people. Posted in USAComments Off on Republican tax reform: All power to the billionaires! Presenting themselves as shocked bystanders to the growing famine in Yemen, the US and UK are in fact prime movers in a new strategy that will massively escalate it. This article was originally published in Middle East Eye. The protagonists of the war on Yemen – the US, UK, Saudi Arabia and the United Arab Emirates – have been beset by problems ever since they launched the operation in March 2015. But these problems seem to have reached breaking point in recent months. First and foremost, is the total lack of military progress in the war. Originally conceived as a kind of blitzkrieg – or “decisive storm” as the initial bombing campaign was named – that would put a rapid end to the Houthi-led Ansarallah movement’s rebellion, almost three years later it has done nothing of the sort. The only significant territory recaptured has been the port city of Aden, and this was only by reliance on a secessionist movement largely hostile to ‘President’ Hadi, whose rule the war is supposedly being fought to restore. All attempts to recapture the capital Sana’a, meanwhile, have been exposed as futile pipe dreams. Secondly, the belligerents have been increasingly at war with themselves. In February of this year, a fierce battle broke out between the Emiratis and Saudi-backed forces for control of Aden’s airport. According to the Carnegie Endowment for International Peace, the struggle “prevented an Emirati plan to move north to Taiz,” adding that “the risk of such confrontations remains…Lacking ground forces anywhere in Yemen, the Saudis worry that the UAE could be carving out strategic footholds for itself, undermining Saudi influence in the kingdom’s traditional backyard.” Notes intelligence analysts the Jamestown Foundation, “The fight over Aden’s airport is being played out against a much larger and far more complex fight for Aden and southern Yemen. The fighting between rival factions backed by Saudi Arabia and the UAE clearly shows that Yemen’s already complicated civil war is being made more so by what is essentially a war within a war: the fight between Saudi Arabia and the UAE and their proxies.” This tension flared up again in October, with Emirati troops arresting 10 members of the Saudi-aligned Islah movement, the Muslim Brotherhood’s Yemeni faction. And finally, the war is undergoing a serious crisis of legitimacy. Aid agencies are usually doggedly silent on the political causes of the disasters they are supposed to ameliorate. Yet on the issue of the blockade – and especially since it was made total on November 6th this year – they have been uncharacteristically vocal, placing the blame for the country’s famine – in which more than a quarter of the population are now starving – squarely on the blockade and its supporters. Jamie McGoldrick, the UN’s humanitarian coordinator for Yemen, put it starkly: “150,000 will die before the end of the year because of the impact of this blockade” he told ABC news last month. Save the Children had already stated back in March 2017 that “food and aid are being used as a weapon of war”, and called for an end to UK arms sales to Saudi Arabia, whilst in November 2017, Oxfam’s Shane Stevenson said: “All those with influence over the Saudi-led coalition are complicit in Yemen’s suffering unless they do all they can to push them to lift the blockade.” Paolo Cernuschi, of the International Rescue Committee, added that: “We are far beyond the need to raise an alarm. What is happening now is a complete disgrace.” The governments of Donald Trump and Theresa May were being painted – by the most establishment-aligned of charities – as essentially mass murderers, accomplices to what Alex de Waal has called“the worst famine crime of this decade”. Even the Financial Times carried a headline that Britain “risks complicity in the use of starvation as a weapon of war”. “Is complicit” would be more accurate than “risks complicity”, but nevertheless: still a pretty damning indictment. To confront these problems, a new strategy has clearly emerged. It appears to have been inaugurated by Theresa May and Boris Johnson on November 29th. 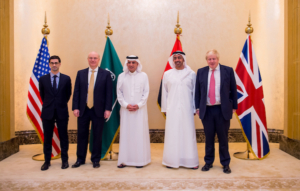 On that date, whilst the British Prime Minister met with King Salman and Crown Prince Mohammed Bin Salman in Riyadh, the Foreign Secretary was hosting a London meeting of the foreign ministers of Saudi Arabia and the UAE and the US under-secretary of state, representing all four of the belligerent powers in Yemen. In fact, the meeting seems to have been more about reassuring the Saudis that her words were but rhetoric for domestic consumption, and not meant to be taken seriously. In the event, far from an “immediate” end, the UK government website reported that May and Salman merely “agreed that steps needed to be taken” and that “they would take forward more detailed discussions on how this could be achieved”. Just to make it absolutely clear that the UK’s support for the war was not in question in any way, the very next line of the statement was “They agreed the relationship between the UK and Saudi Arabia was strong and would endure”. A deeply complicit press ensured that the actual contents of this meeting was barely reported; the last word on the matter, as far as they were concerned, was May’s pledge to “demand” an end to the blockade. Donald Trump followed suit last week, likewise calling on the Saudis to “completely allow food, fuel, water and medicine to reach the Yemeni people” whilst doing nothing to bring this about. Thus have the UK and US governments attempted to manipulate the media narrative such that the blockade they continue to facilitate no longer reflects badly on them. The next aspect of the strategy became obvious before the Johnson and May meetings had even finished, as fighting broke out between the Houthis and forces loyal to former President Ali Abdullah Saleh the same day. Saleh had made an alliance with his erstwhile enemies the Houthis in 2015 in a presumed attempt to seize back power from his former deputy Abdrabbuh Mansur Hadi, to whom he was forced to abdicate power in 2012. But he had never been fully trusted by the Houthis, and their suspicions were to be fully confirmed when on Saturday 2nd December he formally turned on them and offered himself up to the Saudis. Saleh had always been close to the Saudis whilst in power, positioning himself largely as a conduit for their influence; now he was returning to his traditional role. The swiftness and intensity of the Saudi airstrikes supporting his forces against the Houthis following his announcement suggests some degree of foreknowledge and collaboration had preceded it, as does the Saudi’s reported house arrest of their previous favourite Hadi the previous month. This restoration of the Saleh-Saudi alliance represents a victory for the UAE, who had been pushing the Saudis to rebuild its bridges with him for some time. Analyst Neil Partrick, for example, had written just weeks before the move that “The Emiratis are advising the Saudis to go back to the former Yemeni president Ali Abdullah Saleh, believing his growing disputes with the Houthis, his tactical allies, can be encouraged to become a permanent breach.” Thus was the problem of the military stalemate supposed to be solved by splitting the Houthis alliance with Saleh, paving the way for a dramatic rebalancing of forces in favour of the belligerents. The execution of Saleh two days laterhas only partially scuppered this plan, with many of his forces either openly siding with the invaders or putting up no resistance to them. It seems likely that Emirati support for Islah was a quid-pro-quo for Saudi support for Saleh, both moves suggesting perhaps that the two powers’ divisions were to some extent being overcome. But this rapprochement was formalised with the formal announcement of a new military alliance between them on December 5th, the day after Saleh’s death. Thus, within a week of the London and Riyadh meetings, the coalition’s three seemingly intractable problems – the paralysing divisions between UAE and Saudi Arabia, the military stalemate, and the West’s legitimacy crisis over the blockade – had all apparently been turned around. This readjustment was and is intended to pave the way for a decisive new page in the war: an all-out attack on Hodeidah, as a prelude to the recapture of Sanaa itself. This new strategy is now well under way. On December 6th – four days after Saleh switched sides, and one day after the new UAE-Saudi alliance was announced – the invaders’ Yemeni assets mounted “a major push…to purge Al Houthis from major coastal posts on the Red Sea including the strategic city of Hodeida.” The Emiratis had been advocating an attack on Hodeidah for at least a year, but, according to the Emirati newspaper The National, President Obama had vetoed it in 2016, whilst in March 2017, the Saudis got cold feet due to fears that the plan was “an indication of [the Emirates’] attempt to carve out strategic footholds in Yemen”. Now, it seems, it is finally under way. The following day, the red sea town of Khokha, in Hodeidah province, was captured by Emirati forces and their Yemeni assets, backed by Saudi airstrikes. Gulf News reported that “Colonel Abdu Basit Al Baher, the deputy spokesperson of the Military Council in Taiz, told Gulf News that the liberation of Khokha would enable government forces and the Saudi-led coalition to circle Hodeida from land and sea”. The day after that, Houthi positions in Al Boqaa, between Khokha and Hodeidah, were taken by Emirati-backed forces. ABU DHABI: Sheikh Abdullah Bin Zayed Al Nahyan, Minister of Foreign Affairs and International Cooperation, chaired a meeting of the Quartet Committee on Yemen in Abu Dhabi. This intensive activity in the space of just two weeks, bookended by high-level meetings of the ‘quartet’ on either side, is clearly coordinated. But what it heralds is truly horrifying. Presenting themselves as shocked bystanders to the growing famine in Yemen, the US and UK are in fact prime movers in a new strategy that will massively escalate it. 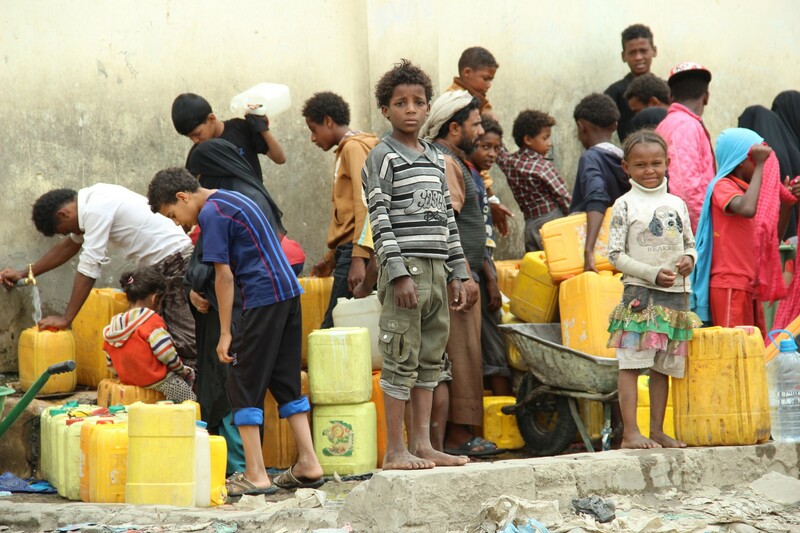 When an attack on Hodeidah was being contemplated back in March 2017, aid agencies and security analysts alike were crystal clear about its impact. A press release from Oxfam read: “Reacting to concern that Hodeidah port in Yemen is about to be attacked by the Saudi-led coalition, international aid agency Oxfam warns that this is likely to be the final straw that pushes the country into near certain famine…Mark Goldring, Oxfam GB Chief Executive said: “If this attack goes ahead, a country that is already on the brink of famine will be starved further as yet another food route is destroyed…An estimated 70 percent of Yemen’s food comes into Hodeidah port. If it is attacked, this will be a deliberate act that will disrupt vital supplies – the Saudi-led coalition will not only breach International Humanitarian Law, they will be complicit in near certain famine.” The point was reiterated by the UN’s World Food Programme, whilst the UN International Organisation for Migration warned that 400,000 people would be displaced were Hodeidah to be attacked. This, then – the ramping up of the ‘weapon of starvation’ – is the ultimate end of this new phase in the war. Basic humanity demands it be vigorously opposed. Major demonstrations have swept through Honduras following a thinly-veiled power grab by the U.S.-backed regime in the November 26 Presidential elections. Salvador Nasralla, the candidate of the progressive Opposition Alliance Against the Dictatorship, was initially reported to have an “irreversible” lead over incumbent President and U.S. lackey Juan Orlando Hernández. Following these reports, the Supreme Electoral Tribunal (TSE), a body that even the New York Times admits is “controlled by Mr. Hernández’s allies,” stopped disclosing results, returning over a day later to incredulously announce Hernández was in the lead and on the path to victory. Only a few years prior, Hernández’s re-election campaign would have been deemed illegal. A constitutional ban on the Honduran President serving longer than one term has been revoked through the efforts of Hernández and his allies. This step towards consolidating power was especially sinister considering that the 2009 military coup against progressive leader and former President Manuel Zelaya was falsely portrayed by the Honduran right-wing and U.S. government as being some sort of anti-authoritarian maneuver. In fact, Zelaya was detained and removed by the military on the very same day that a million-strong petition campaign in the country had led him to schedule a non-binding referendum on the question of creating a constituent assembly. The convocation of a constituent assembly has been a common strategy for left-wing forces in Latin America. For instance, in Venezuela the constituent assembly process, first employed in 1999 and now underway again following the July 30 election this year, reveals the potential of such a mechanism for progressive and even revolutionary changes to the political, social and economic order. Anti-imperialist actions taken by Zelaya during his tenure placed Honduras squarely in the crosshairs of the United States for regime change. Zelaya challenged the presence of U.S. military bases, while entering Honduras into PetroCaribe, a Venezuelan-sponsored organization providing subsidized oil, along with the Bolivarian Alternative of the Americas (ALBA), which was initiated by Venezuela and Cuba. Since the ousting of Zelaya from the Presidency in 2009, nearly $114 million dollars has been spent by the United States to equip the Honduran state’s repressive forces, mainly under the pretext of the “war on drugs”. Beginning under the U.S. administration of key coup backers Barack Obama and then Secretary of State Hillary Clinton, so-called democracy promotion and counter-terrorism efforts in Honduras have left the country as one of the most dangerous places in the world for journalists, activists and organizers, while large amounts of drugs continue to be trafficked. Hernández has already met with the Trump/Pence administration this year, and is fondly referred to by White House Chief of Staff John Kelly as a “good friend.” Kelly is a former General, who at one time led the U.S. military’s Southern Command (SOUTHCOM); the unit responsible for maintaining U.S. imperial dominance in Central and South America. The first term of Hernández saw the looting of public coffers by the right-wing National Party to rig the 2013 elections in his favor, the high-profile assassination of indigenous and environmentalist activist Berta Cáceres, privatization and anti-worker measures, and ongoing police/military repression. ground for the formation of fascist death squads by the CIA. Fed up with worsening conditions of poverty and repression since the coup in 2009 and clearly recognizing the election to be fraudulent, a massive outpouring of Hondurans have taken the streets day and night. Coming into the first weekend of protests, a ten-day curfew order was imposed to be enforced nightly between 6:00 p.m. to 6:00 a.m. Despite several deaths and many hundreds injured, the persistence and refusal of the people to back down has resulted in a number of police ignoring orders to repress demonstrations and make demands upon the government to solve the crisis through “peaceful” means, splitting the ranks of the governments’ repressive forces. 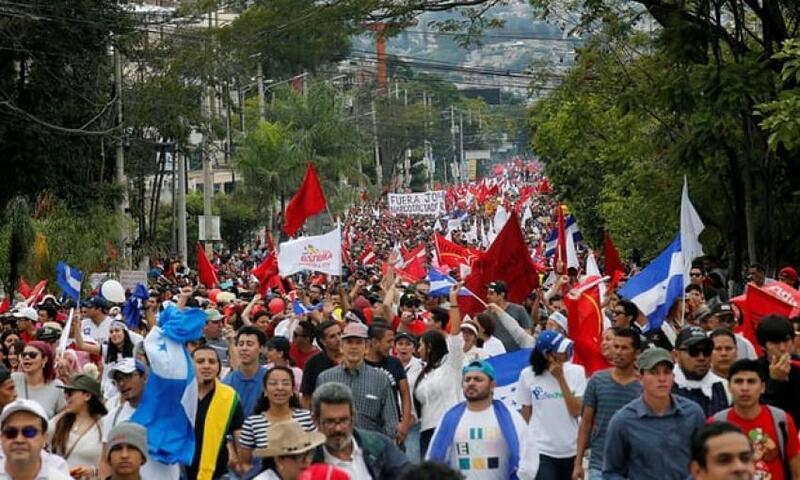 The main force of the Opposition Alliance is the left-wign LIBRE (Freedom and Refoundation) Party, led by Zelaya, and it has been among the main forces organizing anti-fraud demonstrations along with a broad coalition of social movements. These protests represent a continuation of the mass movement following his 2009 coup. Realizing the initial demands for free and fair elections and for Juan Orlando Hernández to get out (Fuera JOH!) are crucial steps for the people of Honduras to claim power over their country. The ANSWER Coalition condemns President Trump’s announcement of his intention to move the U.S. embassy from Tel Aviv to Jerusalem/Al-Quds. On Dec. 6, Trump announced that the United States was becoming the first country to recognize Jerusalem as the capital of Israel. Trump’s announcement, made with the support of the Republican and Democratic Party leadership in the U.S. Senate, is an outrageous attack on the rights of the oppressed Palestinian people and a gift to the racist, apartheid government of Israel, whose clear aim is to colonize all of Palestine and drive out as much of the indigenous Palestinian population as possible. It is also a gross violation of international law and defies the many international bodies that regard the 1980 Israeli annexation of East Jerusalem as illegal. The West Bank, Gaza, Syria’s Golan Heights and East Jerusalem were conquered by Israel in the 1967 aggression known as the Six-Day War. But, contrary to much of the coverage in the mainstream corporate media here, Trump’s announcement does not mean that Jerusalem/Al-Quds is now actually the capital of Israel. The people of Palestine, not Trump, will determine their own national destiny, and they have united to say: Jerusalem is our capital! 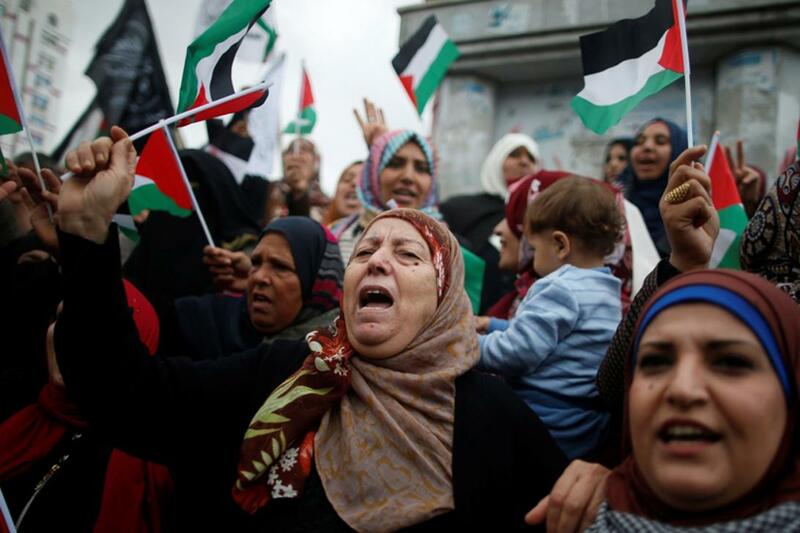 Immediately following Trump’s announcement, people across the West Bank and Gaza took to the streets in protest, with more than 60 wounded by the Israeli occupation forces on Dec. 7. More protests are expected in the coming days. In Palestine and all around the world, protesters are taking to the streets! 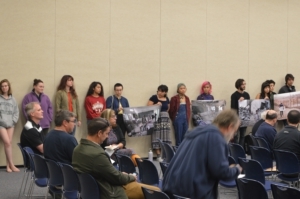 On Wednesday, December 13, over two dozen students at New College of Florida (NCF) entered a faculty meeting and held a silent protest for Palestine and against NCF President Donal O’Shea. 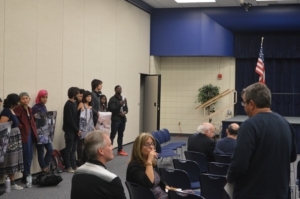 Last week, O’Shea broke the BDS Movement’sacademic boycott of Israel and boasted of Israel’s education system in a shocking op-edin Sarasota Herald Tribune. The article made no mention of Israel’s illegal regime of settler colonialism, apartheid and occupation over the Palestinian people. 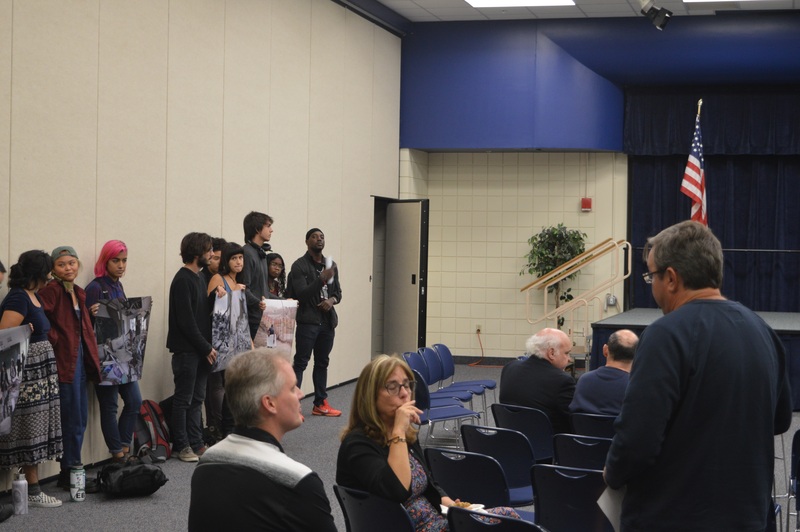 A coalition of student-led groups comprised of Million Hoodies – West Florida Chapter, Students Targeting Oppressive Powers (STOP), Black Student Union, and Students for Sensible Drug Policy joined the action. “The people of Palestine have had their land stolen, have been kicked out their own country, and have faced persecution. How can we be silent when children are being killed by the apartheid state [of Israel] and having their fundamental rights revoked? We have to stand up against the forces of imperialism in all of its forms,” said Million Hoodies member Steven Keshishian. The banner referred to O’Shea’s insinuation that Israel’s illegal occupation and war crimes are merely a response to Arab and Palestinian aggression. “Israel is under constant threat, and their universities respond with programs that address security concerns. In Florida, we are not under threat from neighbors seeking our destruction,” O’Shea wrote in the op-ed. In reality, Palestine is the nation under siege. Palestine has no army, air force or navy. In contrast, Israel’s military budget in 2016 was $17.6 billion. Additionally, in September, the United States agreed to provide Israel a record $38 billion in new military aid over the next decade. To further this dialogue, Million Hoodies – West Florida and Peace Education and Action Center will be cosponsoring an orientation on January 16 for the week long artistic residency There Is A Field, which is centered around a play about Aseel Asleh, a 17-year old Palestinian citizen of Israel killed by police in October 2000. 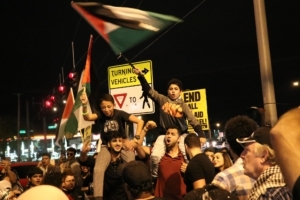 The residency seeks to unite the struggles of Arab, Palestinian, Black & Latinx people in the U.S. Its workshops and performance offer communities who have experienced disproportionate state violence and oppression an opportunity to deeply engage with issues related to Palestine, and the connections these issues have to their own lives and stories. If you’d like to be part of it, just email peacenter@gmail.com! 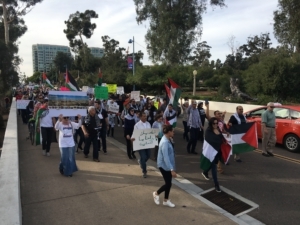 On December 9 organizers and local activists rallied in San Diego’s Balboa Park to protest Trump’s announcement of Jerusalem as the capital of Israel. Nearly 200 supporters arrived to hear speakers address the harsh reality of Israeli rule in occupied Palestine. 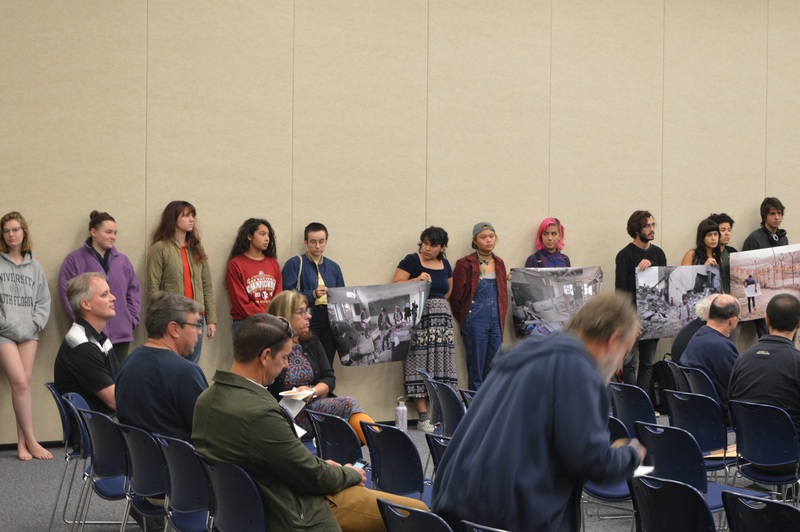 The crowd was diverse and represented the multinational support San Diego has for a free Palestine. Youth, draped in Palestinian flags, mingled side by side with young families, elders and clergy members. 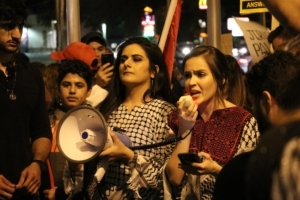 Members of the Party for Socialism and Liberation were also in attendance to show solidarity with the Palestinian struggle for self-determination. The event’s supporters vastly outnumbered any opposition, with only one counter protester halfheartedly toting an Israeli flag. The speakers list represented a diverse quilt of organizations with liberal and religious organizations sharing the air with more radical youth organizers. 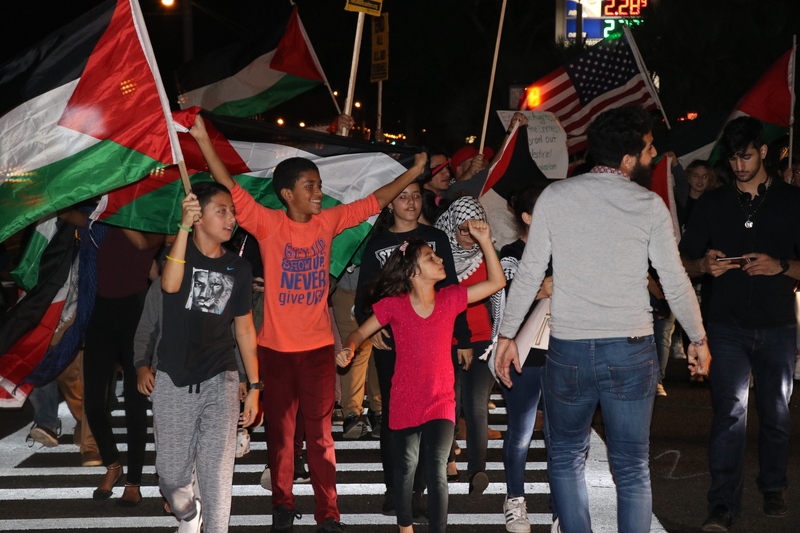 Local imams, anti-Zionist Jewish leaders, and Palestinian youth recounted their experiences both in occupied Palestine and in the United States. To resounding cheers the speakers reminded the crowd that Jerusalem was not Trump’s to give away, and that the rights of Palestinians to self-determination will not be stifled by thinly veiled pandering to the most detestable of Trump supporters. After an inspiring round of opening speeches, the organizers prepared the crowd to march through the busiest portion of Balboa Park, a very popular tourist spot. The march was jubilant and stretched from one end of the park to the other, catching the attention of thousands of tourists enjoying the park in that area. 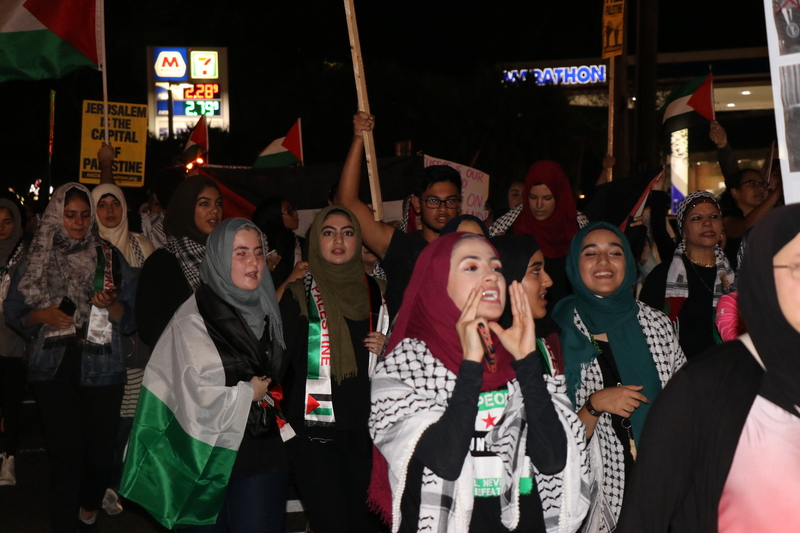 To chants of, “From the rivers to the sea, Palestine will be free!” and “Trump, keep your tiny hands off of Jerusalem!” marchers made it known that San Diego would not let this announcement go without challenge, after a thorough circuit, the march circled back to the original rallying point to hear the remaining speakers. The Palestinian Youth Movement gave a stirring speech and offered an excellent anti-capitalist/anti-imperialist analysis of Trump’s, and the U.S. war machine’s, motives in the region. The rally concluded with organizers pledging to keep in the streets to demand justice for Palestine. Posted on 27 December 2017. 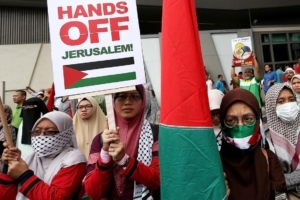 Tags: Palestine: Hands off Jerusalem! On Friday, December 8, over 300 people gathered in Tampa to protest Donald Trump’s decision to move the U.S. embassy to Jerusalem and declare Jerusalem as the capital of Israel, a decision that runs against international law. The unequivocal support for Israel is not unique to the Trump administration. Both Democrats and Republicans have been in lockstep when it comes to legitimizing Jerusalem as the capital of Israel. The declaration is the fulfillment of the Jerusalem Embassy Act of 1995, which mandates that the United States move its embassy to Jerusalem. In the Senate, the bill was cosponsored by such prominent Democrats as Joe Biden and John Kerry, with only one Democrat (the late Robert Byrd) voting against it. In the House of Representatives, just thirty out of 204 Democrats voted against the Embassy Act, along with independent Senator Bernie Sanders. Tampa joined hundreds of cities across the world in protesting the decision. 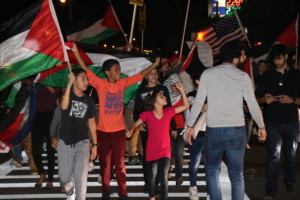 The majority of protesters were Arab and Palestinian, raising dozens of Palestinian Flags and chanting “free free Palestine!” and “Hands off Jerusalem!” The spirit was one of anger, but also one of empowerment as people of all ages— the youngest being two years old and the oldest being 70—joined together to fight for their freedom and the freedom of Palestinians. Saadaldin is one of the founders of the media activist group Peace House, and is running for office in District 58 for Florida House of Representatives as an independent candidate. “We are riding this wave of anti-establishment politics and we want to send a powerful message that the people aren’t tolerating this anymore,” he said. Saadaldin also spoke in support of Boycott, Divestment and Sanctions, an international movement that has been tremendously successful in bringing attention to Israel’s countless human rights violations. As Murphy said in his speech, “We stand here today in the belly of the beast.” It is our obligation as citizens of the most powerful imperialist state on the planet to stand up and fight for the end of imperialism. The U.S. continues to provide billions of dollars of military aid to Israel, as it has done for decades, so that the apartheid state of Israel can “protect itself” from Palestinians who have no military at all. What Trump and the U.S. really care about is maintaining an imperialist stronghold in the Middle East. We must continue to build an anti-imperialist movement separate from the two-party system, because as we know, if there is anything that both Democrats and Republicans agree on, it’s war. Moreover, we must have something to fight for. We must fight for the true freedom of socialism: freedom from poverty, exploitation and racism; freedom to have healthcare, education, and housing; and freedom for oppressed nations, for all of humanity and for Palestine.